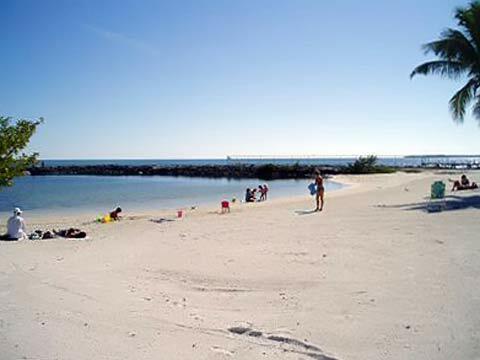 This Tavernier Beach is inside the Monroe County's Harry Harris park. This is another man-made beach on the Atlantic Ocean. There is a wide expanse of white sand with a number of covered picnic tables and a bath house. Directions: Mile Marker 92.5 oceanside, Overseas Highway. Take Burton Drive to its end. Map Includes: Ball park, playground and bike path. Features: Covered Pavilion, Restrooms, Showers, Boat Ramp, Grills and Picnic Tables. Park Hours: Sunrise to Sunset. Park Fees: For Non-County Residents only, on Saturday, Sunday and Federal Holidays, $5 per person over 16 years of age.